May 14 (Bloomberg) -- Crude oil is poised for a second weekly decline as the strengthening dollar curbed the appeal of commodities to investors amid above-average U.S. supplies. Oil dropped for a fourth day as the U.S. currency climbed against the euro after Portugal announced austerity measures, spurring concern that fiscal tightening across Europe will limit economic growth. The Energy Department said May 12 that crude supplies at Cushing, Oklahoma, where New York-traded West Texas Intermediate oil is stored, rose to a record. Crude oil for June delivery dropped 42 cents, or 0.6 percent, to $73.98 a barrel, in electronic trading on the New York Mercantile Exchange at 9:44 a.m. Sydney time. Yesterday, the contract fell $1.25 to $74.40. Futures are poised for a 1.4 percent decline for the week. Europe’s common currency has dropped 1.7 percent against the dollar this week, following the EU’s plan to shore up the region’s finances. The package included a pledge from the European Central Bank to buy government and private bonds to stem a surge in borrowing costs among so-called peripheral nations such as Greece, Spain and Portugal. The dollar traded little changed at $1.2536 a euro at 9:36 a.m. Sydney time, after gaining 0.6 percent yesterday. Oil also slipped after U.S. equities retreated on widening probes of banks’ mortgage-bond deals. The Standard & Poor’s 500 Index declined 1.2 percent to 1,157.44, and the Dow Jones Industrial Average fell 1.1 percent to 10,782.95. Stockpiles of crude oil at Cushing rose 784,000 barrels to 37 million, the highest level since the Energy Department began reporting on inventories at the hub in April 2004. Nationwide U.S. oil supplies gained 1.95 million barrels to 362.5 million, the 14th increase in 15 weeks, according to the department. The increase left stockpiles 6.1 percent above the five-year average for the period, up from 5.4 percent the previous week. Brent crude oil for June settlement declined $1.09, or 1.3 percent, to end the session at $80.11 on the London-based ICE Futures Europe exchange yesterday. May 13 (Bloomberg) -- Soybeans fell for a second straight session on speculation that record harvests in South America will reduce demand for U.S. supplies. Brazil and Argentina, the biggest exporters after the U.S., will produce a combined 122 million metric tons (4.48 billion bushels) this year, up 36 percent from last year’s drought- reduced harvest, the Department of Agriculture said this week. World inventories were projected to rise 48 percent to a record 63.8 million tons. Soybean futures for July delivery fell 1 cent, or 0.1 percent, to $9.645 a bushel on the Chicago Board of Trade. The commodity has fallen 8 percent this year. Prices also declined on expectations that U.S. farmers will be able to accelerate planting of the country’s second-biggest crop, Henderson said. Warm, dry weather will return to the U.S. Midwest by May 15, firming soil to support seeding equipment after most areas received about twice the normal rainfall this week, Chicago- based T-Storm Weather LLC said today in a report to clients. About 30 percent of the soybean crop was planted as of May 10, up from 15 percent a week earlier and 13 percent a year earlier, according to the USDA. “Weather conditions will improve and that should increase planting progress,” Henderson said. The soybean crop in the U.S., the world’s largest grower and exporter, was valued at $31.8 billion last year, behind corn at $48.6 billion, government figures show. FCPO July Futures contract traded RM35 lower as compare to previous trading sessions to close at RM2472 with a total of 7,422 lots traded in the market. FCPO price trade lower after tracking closely with soybean oil and crude oil electronic trading were traded lower during trading sessions. 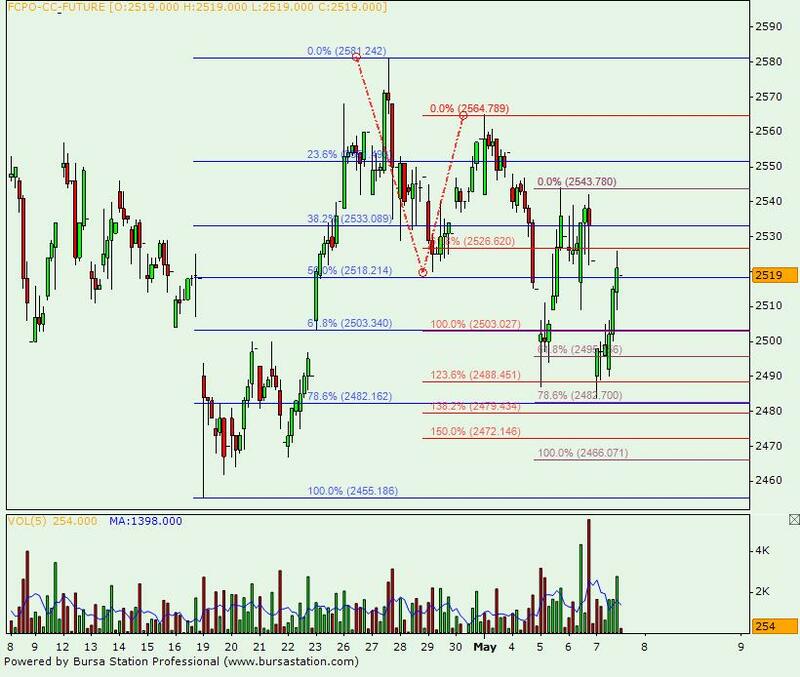 FCPO price seem temporary holding above RM2482; previous 78.6% Fibonacci support, before price crash below previous support levels at RM2481 regions after attempt to trade above resistance levels at RM2516 failed. Technically, with penetration of 1st critical support levels at RM2482 regions, FCPO price would encounter further selling pressure in the coming trading sessions provided resistance levels at RM2494 and RM2516 were not violated in the coming trading sessions. 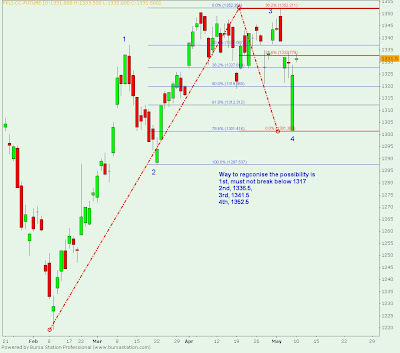 FCPO price next nearest support levels were seen at RM2455 and RM2441 regions. FKLI May Futures contract was traded marginally 1 point higher as compare to previous trading session to close at 1341.5 levels with a total of 4,795 lots traded in the market. 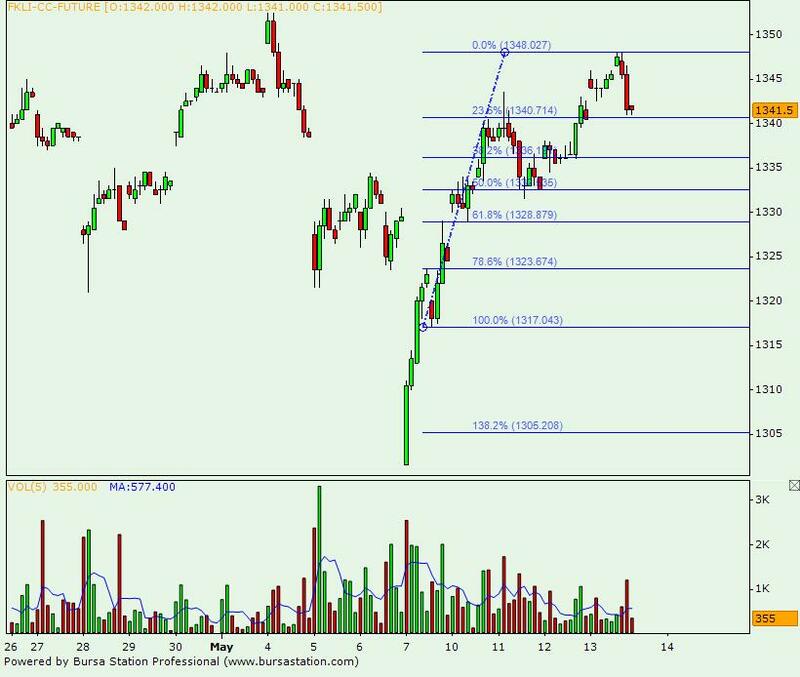 FKLI retrace lower after reach new height during trading sessions as Dow Jones futures electronic trading were trading lower before end of trading sessions. 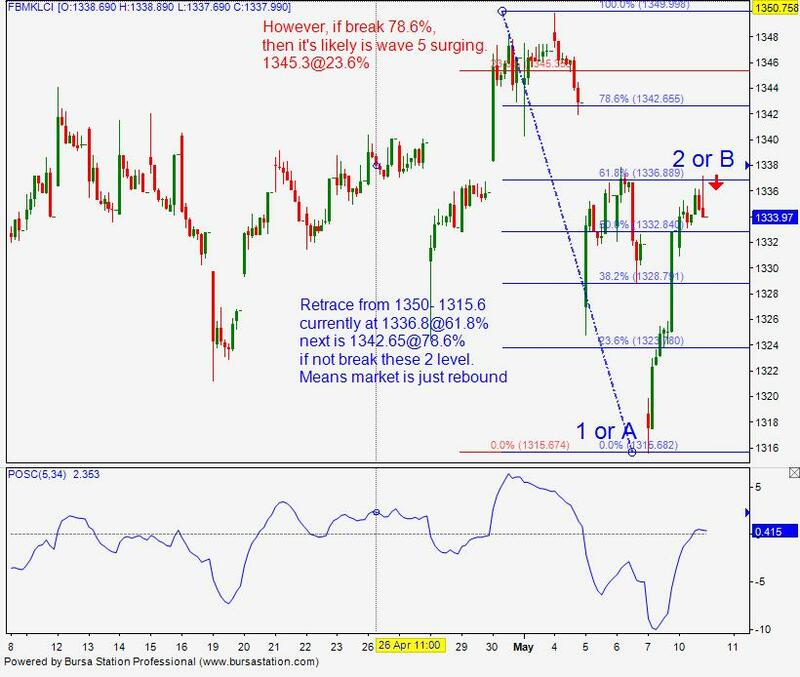 FKLI opened higher and completed 138.2% Fibonacci resistance level at 1347.5 before begin to retrace lower towards 23.6% Fibonacci support levels at 1340.5 regions. 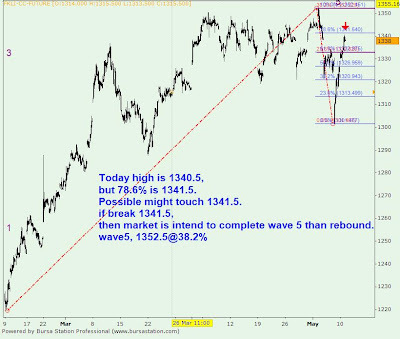 Technically, FKLI would expected to trade higher once affirm to penetrate previous resistance levels at 1341 regions. 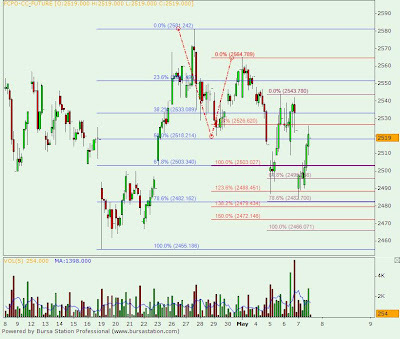 However, FKLI would expected some degree of selling pressure around 1352.5 and 1352 and 1358 regions; 23.6% and 38.2% Fibonacci resistance levels. 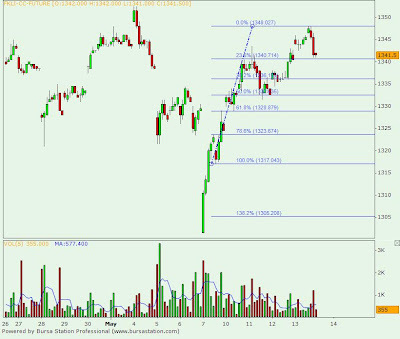 FKLI support levels were seen at 1333 and 1323.5; 50% and 78.6% Fibonacci support levels. May 13 (Bloomberg) -- Crude oil traded below $76 a barrel in New York after declining as a U.S. government report showed that inventories climbed for the 14th time in 15 weeks as refiners reduced processing rates. Oil dropped 0.9 percent yesterday after the Energy Department said U.S. crude supplies gained 1.95 million barrels last week to 362.5 million. Stockpiles at Cushing, Oklahoma, where the New York-traded West Texas Intermediate oil grade is stored, rose to a record. The International Energy Agency cut its estimate of world oil demand this year by 220,000 barrels to 86.4 million barrels a day in a monthly report. Crude oil for June delivery traded at $75.66 a barrel, up 1 cent, in electronic trading on the New York Mercantile Exchange at 9:45 a.m. Sydney time. Yesterday, the contract fell 72 cents to $75.65 a barrel, the lowest settlement since May 7. Inventories at Cushing increased 784,000 barrels to 37 million, the highest level since the department began reporting on supplies at the hub in April 2004. U.S. crude oil stockpiles were forecast to increase 1.6 million barrels, according to the median of 17 analysts in a Bloomberg News survey. Refineries operated at 88.4 percent of capacity, down 1.2 percentage points from the prior week and the first decline since March, the Energy Department report showed. Gasoline inventories fell 2.81 million barrels to 222.1 million last week, the report showed. Supplies of gasoline were forecast to increase by 400,000 barrels, according to the Bloomberg News survey. The Organization of Petroleum Exporting Countries bolstered oil output by 40,000 barrels a day in April, according to the IEA. Supplies from the 11 members bound by quotas rose to 26.79 million barrels a day, 70,000 barrels a day more than in March. That means the group’s compliance with the record output cuts slipped to 54 percent last month. Iraq has no output target. OPEC members will need to pump 28.7 million barrels a day to balance global oil demand and supply this year, according to the IEA. That is 400,000 barrels fewer than the Paris-based agency estimated last month. Brent crude oil for June settlement rose 71 cents, or 0.9 percent, to $81.20 on the London-based ICE Futures Europe exchange yesterday. May 13 (Bloomberg) -- The yen may extend losses against higher-yielding currencies as signs the global economy is recovering damp demand for Japan’s currency as a refuge. The euro climbed against 14 of its 16 major counterparts after American stocks rose and before reports forecast to show Australia added jobs and initial unemployment claims in the U.S. declined. The euro pared a two-day loss against the dollar as demand rose at a Portuguese debt auction and Spain announced budget reductions. Japan’s currency traded at 117.74 per euro as of 7:40 a.m. in Tokyo from 117.62 in New York yesterday, when it touched 116.57, the highest since May 7. The yen was at 93.15 per dollar from 93.24. The euro rose to $1.2639 from $1.2614. It fell to $1.2529 on May 6, the weakest level since March 5, 2009. Australia’s dollar traded at 83.43 yen from 83.32 yen. It was at 89.54 U.S. cents from 89.36 cents. The Standard & Poor’s 500 Index rose 1.4 percent and the Dow Jones Industrial Average gained 1.4 percent yesterday. Australian employers added 22,500 jobs in April from March, according to the median estimate of economists in a Bloomberg News survey before the statistics bureau reports the data in Sydney today. Initial jobless claims in the U.S. fell 4,000 to 440,000 last week, another Bloomberg survey showed before the Labor Department report today. Portugal sold 1 billion euros ($1.3 billion) of 10-year bonds yesterday, getting more demand than at previous auctions. The country’s debt agency priced the 4.8 percent bonds due 2020 to yield 4.52 percent, 181 basis points below last week’s high, which was a record since the euro’s introduction. Spain’s Socialist Prime Minister Jose Luis Rodriguez Zapatero reversed an earlier commitment and cut public wages, acceding to pressure from the rest of Europe to reduce spending to avoid being dragged deeper into the Greek crisis. Finance Minister Elena Salgado said as recently as February that Spain would honor wage agreements with public-sector unions. The government plans to cut public wages 5 percent this year and freeze them in 2011 while suspending a pension raise, Zapatero told parliament in Madrid yesterday. A subsidy for new parents will be scrapped and foreign aid trimmed, he said. The euro has lost 8.3 percent this year, according to Bloomberg Correlation-Weighted Indexes. The dollar has gained 5.4 percent, and the yen has advanced 5.2 percent. May 11 (Bloomberg) -- The Organization of Petroleum Exporting Countries raised estimates for global oil demand in 2010 on optimistic outlook for economic growth in China. OPEC, responsible for about 40 percent of the world’s oil, boosted its forecast for worldwide crude consumption this year by 180,000 barrels a day, or 0.2 percent, to 85.38 million barrels per day. It also raised projections for supplies from outside the organization. OPEC, which announced a record series of supply cuts in late 2008 as demand crumpled, is unlikely to alter output quotas this year, Algerian energy ministry Chakib Khelil said in Doha May 9. A 30 percent rebound in oil prices during the past year has encouraged members to produce in excess of the allocations they agreed on December 2008. Crude futures traded around $75 a barrel in New York today. Compliance among the 11 OPEC states bound by quotas slipped to 51 percent in April, from 52 percent the previous month, as members led by Venezuela, Nigeria and Saudi Arabia raised output. The 11 nations, excluding Iraq, pumped 29.25 million barrels a day last month, according to the report. Producers outside the organization will provide 51.67 million barrels a day this year, about 140,000 barrels per day more than OPEC forecast in last month’s report. That equates to growth of 53,000 barrels a day, or 1 percent from 2009. The world’s demand for OPEC crude will be 28.8 million barrels a day in 2010, about 40,000 barrels per day more than the organization forecast last month. Still, this “call-on- OPEC” will be 100,000 barrels a day lower this year than in 2009, according to the report. Global oil demand growth this year will amount to 950,000 barrels a day, or 1.1 percent, according to OPEC. It raised its forecast for Chinese consumption by 50,000 barrels a day to 450,000 barrels a day. The International Energy Agency, due to update its outlook tomorrow, estimated in its April 13 report that global demand will expand by 1.7 million barrels a day, or 2 percent, to 86.6 million barrels per day in 2010. “The global economy is improving, but the challenges of sovereign debt in the developed countries, the ability of China to avoid overheating and persistently high unemployment levels need careful monitoring,” OPEC said. OPEC’s 12 members are Algeria, Angola, Ecuador, Iran, Iraq, Kuwait, Libya, Nigeria, Qatar, Saudi Arabia, the United Arab Emirates and Venezuela. The organization’s next meeting is scheduled for Oct. 14 in Vienna. May 12 (Bloomberg) -- Crude oil fell for a second day on concern that Europe’s $1 trillion bailout is insufficient to end the region’s sovereign debt crisis, eroding fuel consumption. Oil dropped 0.6 percent yesterday after the euro weakened against the dollar on concern that Greece, Spain and Portugal will struggle to contain their deficits. U.S. crude stockpiles rose 362,000 barrels last week, according to the American Petroleum Institute. A government report today will also show inventories increased, according to a Bloomberg News survey. Crude oil for June delivery dropped as much as 73 cents, or 1 percent, to $75.64 a barrel, in electronic trading on the New York Mercantile Exchange, and was at $75.70 at 9:46 a.m. Singapore time. Yesterday, the contract fell 43 cents, or 0.6 percent, to close at $76.37. Leaders of the 16 European nations using the single currency agreed to lend as much as 750 billion euros ($946 billion) to the most-indebted member countries. The European Union was responsible for about 17 percent of global oil demand in 2008, according to BP Plc, which publishes its Annual Statistical Review of World Energy each June. Oil rose 2.3 percent May 5 on the announcement. The dollar traded at $1.2646 per euro at 11:22 a.m., up 0.1 percent from $1.2662 yesterday. U.S. crude oil stockpiles probably increased 1.6 million barrels in the week ended May 7 from 360.6 million a week earlier, according to the median of 17 analyst estimates before an Energy Department report today. “It’s still a case of oversupply in the U.S. market,” CWA’s Hassall said. The Petroleum Institute collects stockpile information on a voluntary basis from operators of refineries, bulk terminals and pipelines. The government requires that reports be filed with the Energy Department for its weekly survey. China expanded its daily crude processing volume by 17 percent to a record 8.4 million barrels a day in April, according to data released yesterday by China Mainland Marketing Research Co., which compiles information for the government. The Organization of Petroleum Exporting Countries yesterday increased its 2010 demand outlook on gains in Chinese consumption. OPEC expanded its forecast for worldwide consumption this year by 180,000 barrels, or 0.2 percent, to 85.38 million barrels a day. The group boosted its Chinese demand estimate by 50,000 barrels a day to 450,000. Brent crude oil for June settlement dropped as much as 52 cents, or 0.7 percent, to $79.97 a barrel on the London-based ICE Futures Europe exchange, and was at $80.07 at 9:47 a.m. Singapore time. Yesterday, the contract increased 37 cents, or 0.5 percent, to end the session at $80.49. May 12 (Bloomberg) -- The euro fell for a second day against the dollar amid concern the region’s most-indebted nations will struggle to contain their deficits, slowing Europe’s economic recovery. The 16-nation currency weakened versus 13 of its 16 major counterparts before a German report that may show the recovery in Europe’s largest economy stalled for a second quarter. The pound traded near a 10-month high against the euro after Conservative leader David Cameron struck a deal with Britain’s third-largest party to form a coalition government, easing concern over a hung parliament. The euro fell to $1.2644 as of 9:40 a.m. in Tokyo from $1.2662 in New York yesterday. The currency traded at 117.28 yen from 117.32 yen. The dollar was at 92.72 yen from 92.65 yen. The single currency climbed as high as $1.3094 on May 10 after euro zone leaders announced an agreement to provide loans of as much as 750 billion euros ($949 billion), including support from the International Monetary Fund. Greece’s budget deficit of 13.6 percent of gross domestic product is the second-highest in the euro zone after Ireland’s 14.3 percent. As part of the bailout plan, Spain and Portugal also pledged deeper deficit reductions than previously planned. Germany’s gross domestic product was unchanged in the first quarter from the prior three months, according to a Bloomberg News survey before the Federal Statistics Office report today. Federal Reserve Chairman Ben S. Bernanke told U.S. senators yesterday that the euro region’s aid package to stem its debt crisis isn’t a cure-all, according to a participant. “He said, ‘This is basically not a panacea,’” and that the measures are “temporary,” Alabama Senator Richard Shelby, the senior Republican on the Banking Committee, told reporters in Washington after a closed-door briefing Bernanke held with the panel. “There’s got to be fundamental underlying changes in their economies, not just Greece, but a lot of other countries,” Shelby cited Bernanke as saying. The euro has lost 8.2 percent this year, according to Bloomberg Correlation-Weighted Indices. The dollar has gained 5.5 percent, and yen has advanced 5.8 percent. The pound rose yesterday against the dollar and the euro as Cameron replaced Gordon Brown after five days of talks following elections May 6 that failed to produce a majority for the first time since 1974. His coalition partner, Nick Clegg, head of the Liberal Democrats, became deputy premier. The coalition government will propose 6 billion pounds ($8.97 billion) of cuts within 50 days to reduce a record budget deficit, raise the threshold to pay income tax, study a split between retail and investment banking and increase the Bank of England’s oversight of the financial industry, Conservative officials said. The pound traded at 84.83 pence per euro from 84.66 pence yesterday. The currency climbed to 84.28 pence on May 6, the strongest level since June 22, 2009. FCPO 3rd month July futures contract traded RM24 lower to close at RM2505 levels as compare to previous trading sessions with a total of 7,539 lots traded in the market. FCPO price was mainly traded lower during trading sessions as crude oil and soybean oil were traded lower during electronic trading. 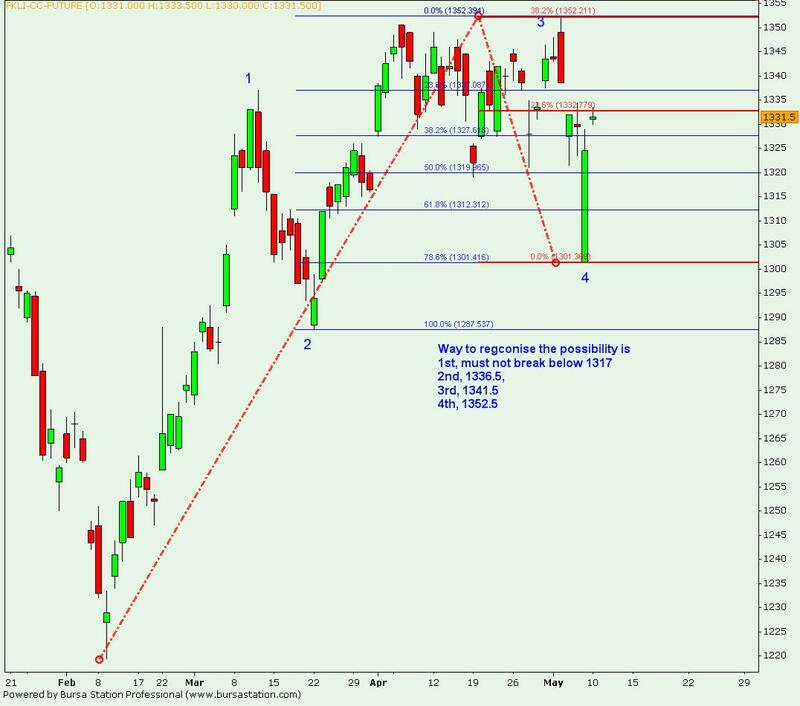 FCPO price attempt to search for firm support during trading sessions which directly lead to low at RM2496; 78.6% Fibonacci support levels. 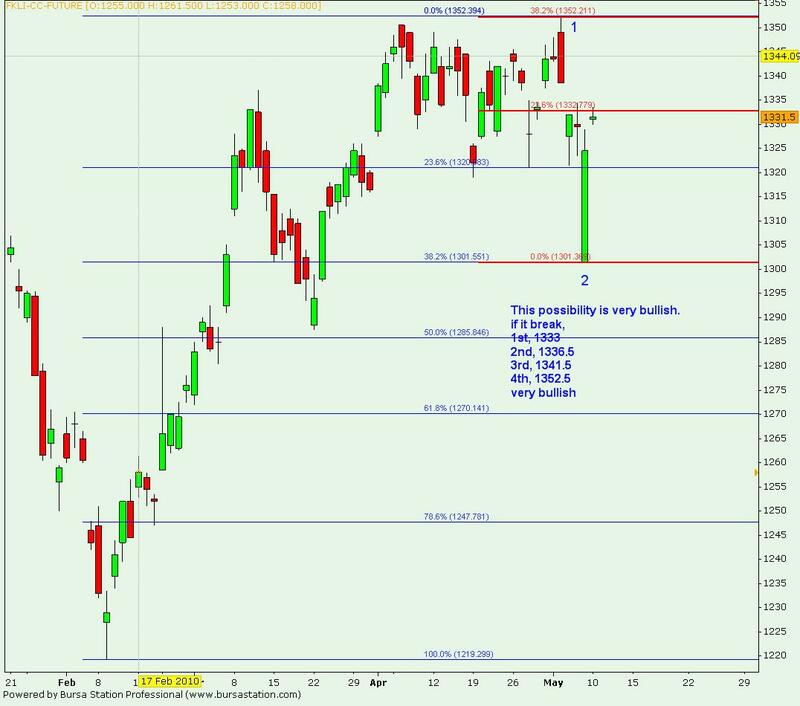 Technically, FCPO price would seems finish correction phase provided support levels at RM2482 and RM2455 were not violated in the coming trading sessions. However, in order for FCPO trading to be more affirming riding on uptrend, traded price would preferably trading above resistance levels at RM2525 and RM2546 regions. 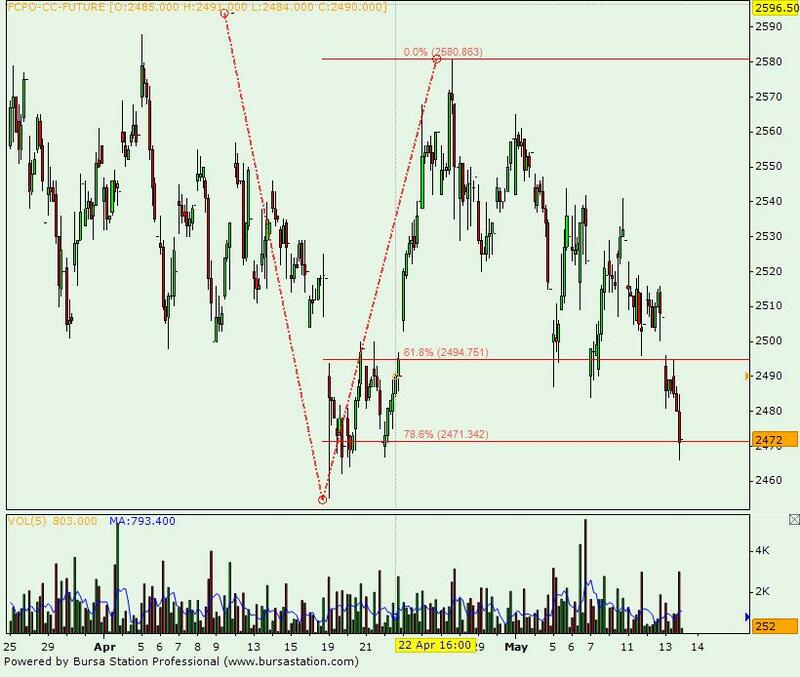 FKLI Apr Futures contract traded 5.5 points lower to close at 1332.5 levels as compare to previous trading session to with a total of 8,201 lots traded in the market. FKLI was traded lower in the 2nd trading sessions as most of the regional indices and Dow Jones electronic trading were traded lower despite FKLI was open higher due to Dow Jones firm overnight trading. 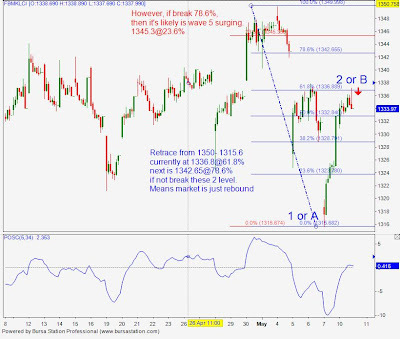 FKLI failed to penetrate resistance levels at 1341.5; 78.6% and 350% Fibonacci resistance levels, which directly leads to further sell down towards support levels at 1332.5; again 78.6% Fibonacci support levels, from the nearest wave 4 count. 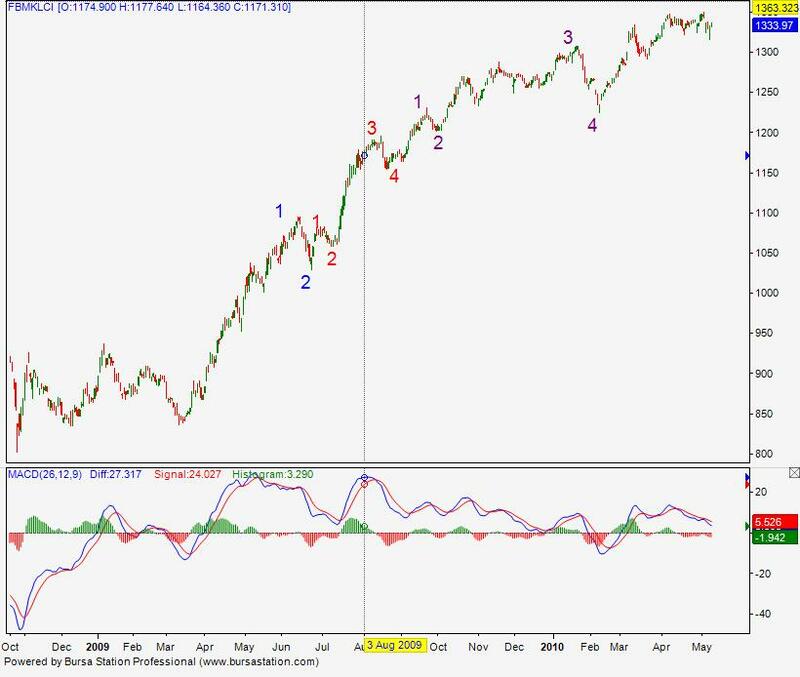 Technically, FKLI was assuming complete rebound wave at 1343.5 regions before resume on correction count towards south where next nearest support levels were seen at 1327 and 1320, both are 78.6% and 123.6% Fibonacci support levels. 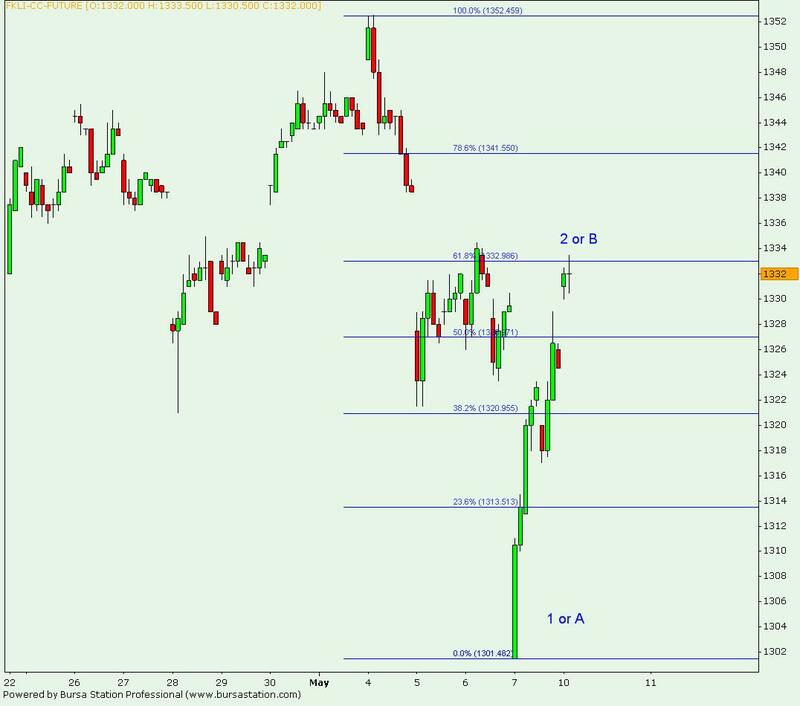 However, it’s crucial that resistance levels at 1337 and 1341; both are 50% and 78.6% Fibonacci resistance levels, were not violated in the coming trading sessions. FCPO 3rd month July futures contract traded RM10 higher to close at RM2529 levels as compare to previous trading sessions with a total of 7,887 lots traded in the market. FCPO price was traded wild during trading sessions as crude oil and soybean oil electronic trading was trading higher while MPOB report shows bullish sentiment. 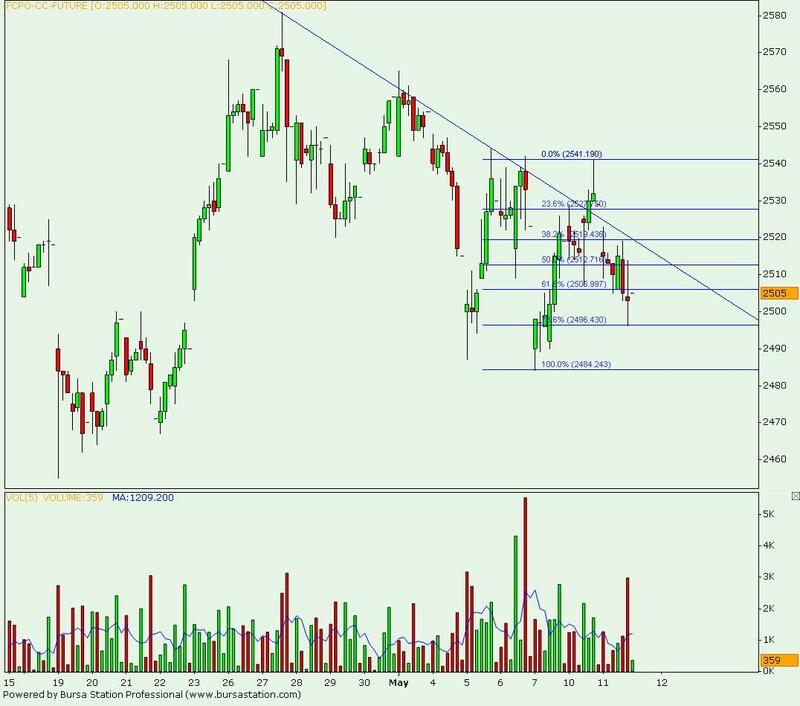 FCPO price found support at RM2507 regions; 50% Fibonacci support levels, before surge higher in attempt to penetrate resistance trend line in the hourly price chart. 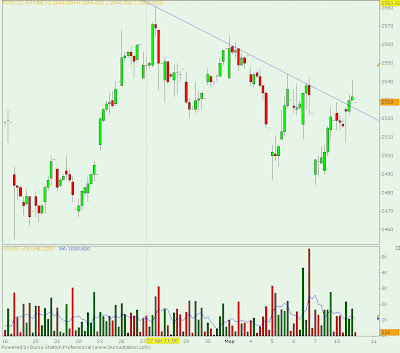 Technically, FCPO seems penetrate the hourly resistance trend line but have yet penetrate previous high regions at RM2542 regions. FCPO price was required to overcome resistance levels at RM2542 and RM2564 in order to further affirm bullish sentiment in the coming trading sessions. 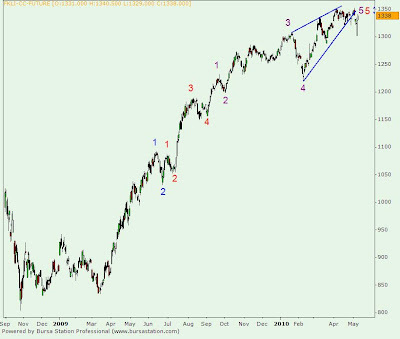 However, it’s crucial that support levels at RM2480 and RM2455 must not be violated at anytime during trading sessions in order to remain intact with uptrend. FKLI Apr Futures contract surge 13.5 points higher to close at 1338 levels as compare to previous trading session to with a total of 7,275 lots traded in the market. FKLI was traded higher during trading sessions as regional indices and Dow Jones futures electronic trading were traded higher despite Dow Jones were settle weak during overnight trading. 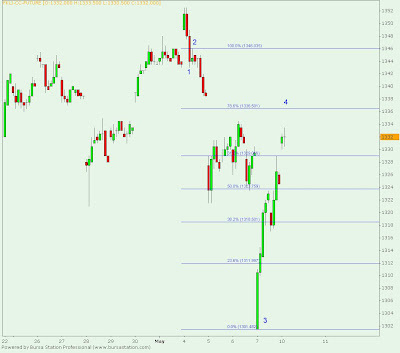 FKLI further extent higher after found temporary support at 1330 regions; 50% Fibonacci support levels. 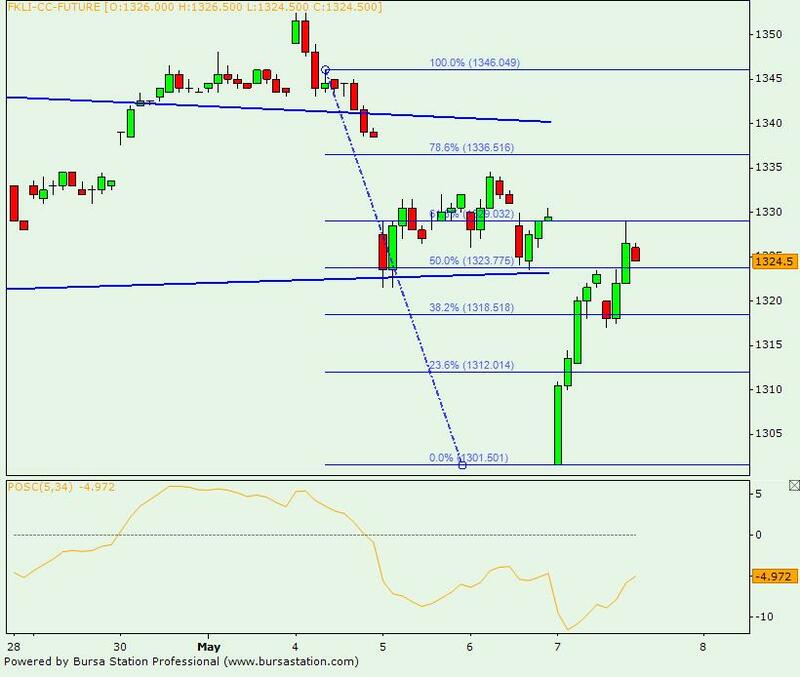 Technically, FKLI seems surge higher in attempt to test next nearest resistance levels at 1341.5; 78.6% Fibonacci resistance levels. 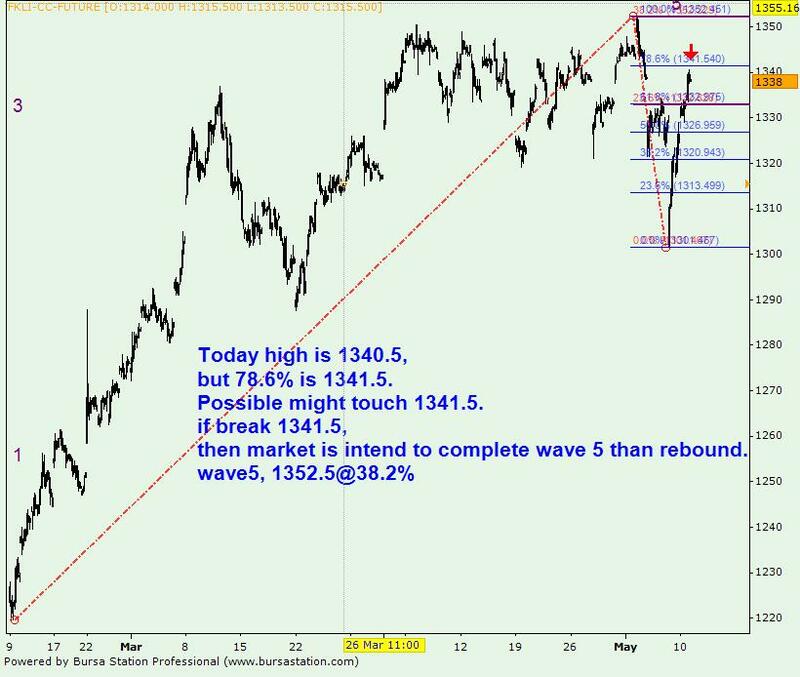 FKLI would resume into correction phase provided attempts failed to penetrate resistance levels at 1341.5 regions and 1352.5 regions. 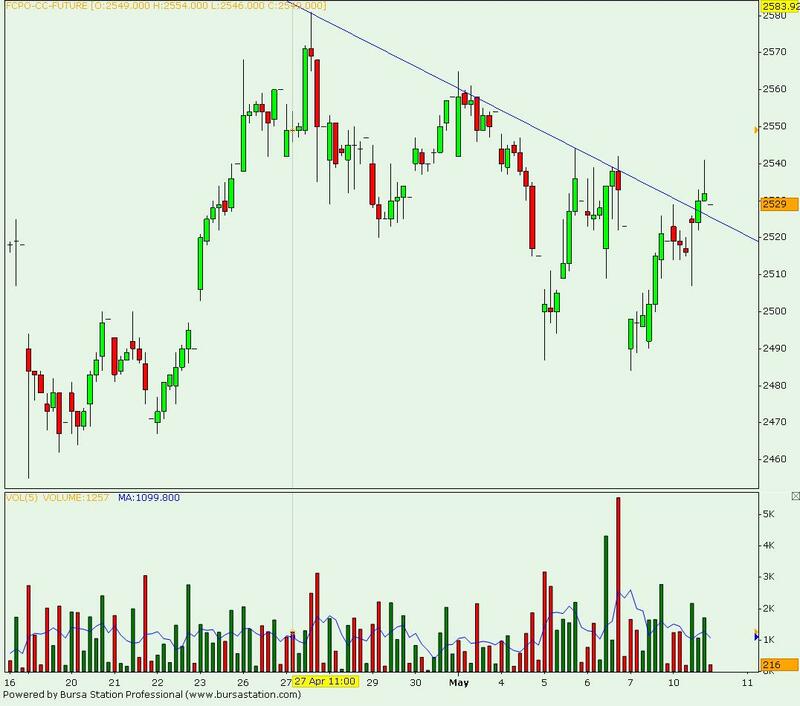 On the contrary, failure to resist price trading below resistance levels shall indicate short term bullish in FKLI market. 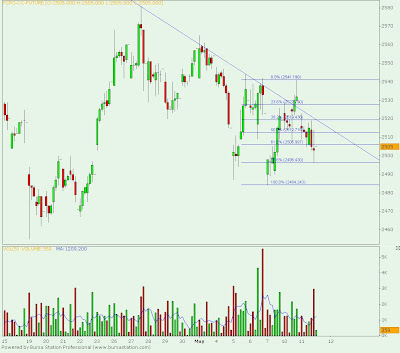 However, FKLI need to penetrate support levels at 1337.5 and 1329 in order to further affirm on the correction phase. May 10 (Bloomberg) -- Crude oil demand will gain this year and prices may rise to more than $85 a barrel as markets shrug off concern a debt crisis in Greece may spread to other European nations and slow growth, OPEC ministers said. “By bailing out Greece, its bailing out the future of Europe,” Algeria’s oil minister Chakib Khelil said today at a conference in Doha, Qatar. “Prices should go back to $80 to $85 a barrel.” Libya’s National Oil Corp. Chairman Shokri Ghanem said “prices could reach $85, $87, even higher” after the European Union rescue package. Oil rose for the first time in a week today after EU governments and the International Monetary Fund agreed to an emergency lending mechanism of about 720 billion euros ($928 billion). Crude for June delivery rose as much as 4.5 percent to $78.51 a barrel on the New York Mercantile Exchange and traded at $76.17 at 13:10 p.m. in New York. While the Greek debt crisis may have a “psychological” impact on crude markets, it will have no impact on fundamentals as supplies remain sufficient, Qatar’s Oil Minister Abdullah al- Attiyah said in Doha. Members of the Organization of Petroleum Exporting Countries should abide by oil-production levels approved in 2008 even as demand increases, Abdalla Salem El-Badri, the group’s secretary general, said yesterday. The ministers spoke at a meeting of the Organization of Arab Petroleum Exporting Countries, which includes seven of OPEC’s 12 members and ends May 12. “Oil demand is very good, it is going to increase this year,” Saudi Arabia’s Ali al-Naimi said to Bloomberg in Doha yesterday. Use of crude will rise in China, India and the Middle East, as those countries “are not affected by what’s happening in Greece,” Algeria’s Khelil said in an interview yesterday. Ministers from Arab oil-producing nations gathering in Doha showed no signs of wanting to raise or lower OPEC’s existing production targets even as oil prices declined 13 percent last week, the biggest drop since December 2008. Crude slumped, reaching a 12-week low on May 7, as U.S. gasoline inventories exceed seasonal norms and Europe struggled with the Greek debt crisis that may slow economic recovery and demand for fuel. Before today oil had retreated from its 18-month high of $87.15 reached May 3. Crude futures dropped to $74.51 on May 7, the weakest intra-day price since Feb. 16. The fluctuations have sent volatility to its highest in almost two months. Al-Naimi, minister of the world’s largest crude oil exporter, brushed off the possibility of the Greek crisis spreading, saying “we shouldn’t be concerned about these little things.” The minister said on March 30 that he “hopes” prices will stay at $70 to $80 a barrel. State-owned Saudi Arabian Oil Co. will supply full volumes of crude oil to Asia for loading in June. This will be the seventh consecutive month the company will provide 100 percent of cargoes, according a survey of Asian refinery officials. OPEC agreed in March to uphold output quotas for a fifth time. The group slashed production quotas at a meeting in December 2008, after energy demand fell during the worst recession since World War II. Crude oil prices slumped from a record $147 a barrel in July that year to $32 in December. Members are currently exceeding those allocations by about 2 million barrels a day. “We just have to abide by that decision,” OPEC’s El-Badri said, putting members’ compliance to the quota at 51 percent. The oil market has excess production capacity of six million barrels a day, Algeria’s Khelil said today. Crude oil inventories in the U.S. gained 9.6 percent over the past three months to 360.6 million barrels, the highest since June 2009, according to government data. OPEC’s members are Algeria, Angola, Ecuador, Iran, Iraq, Kuwait, Libya, Nigeria, Qatar, Saudi Arabia, the United Arab Emirates and Venezuela. OPEC’s next meeting is on Oct. 14. May 11 (Bloomberg) -- Crude oil advanced for a second day after an almost $1 trillion loan plan by European policy makers to end the region’s sovereign-debt crisis caused global stocks to rally and signaled energy demand may strengthen. Oil rose from a 12-week low yesterday after the European Union and the International Monetary Fund agreed to offer as much as 750 billion euros ($954 billion) to countries facing instability. Crude prices may return to $80 to $85 a barrel once the debt crisis is resolved, Algerian Energy Minister Chakib Khelil said yesterday at a meeting in Doha, Qatar. Crude oil for June delivery gained 45 cents, or 0.6 percent, to $77.25 a barrel, in electronic trading on the New York Mercantile Exchange at 9:10 a.m. Sydney time. Yesterday, the contract rose $1.69, or 2.3 percent, to settle at $76.80. The MSCI World Index jumped 4.9 percent yesterday, while the Standard & Poor’s 500 Index gained 4.4 percent. The dollar declined against the euro, increasing the appeal of commodities as an alternative investment. The U.S. currency traded little changed at $1.2784 at 8:25 a.m. Sydney time, after falling 0.3 percent yesterday. European Union finance chiefs met in a 14-hour session in Brussels to come up with the program of bond purchases designed to halt a sovereign-debt crisis that has threatened to shatter confidence in the euro. The European Central Bank said it will buy government and private debt. China, the world’s second-biggest energy consumer after the U.S., increased net imports of crude oil to a record in April as demand from factories rose and car sales climbed, preliminary data released by China’s General Administration of Customs showed yesterday. Chinese net imports reached 20.98 million metric tons, or about 5.1 million barrels a day. The previous record was in December when net shipments climbed to 20.9 million tons. Imports in April rose to 21.17 million tons while exports were at 190,000 tons, according to yesterday’s figures. U.S. oil inventories probably climbed 1.1 million barrels last week from 360.6 million barrels the week before, based on the median estimate in a Bloomberg News survey of 11 analysts before an Energy Department report tomorrow. It would be the 14th increase in 15 weeks. Saudi Arabian Oil Co., the world’s largest state-owned oil company, will supply 100 percent of cargoes sold under long-term contracts in June, according to a survey of refinery officials in Japan, Taiwan and South Korea who asked not to be identified, citing confidentiality agreements with the Middle East producer. Brent oil for June settlement on the London-based ICE Futures Europe exchange rose $1.85, or 2.4 percent, to $80.12 a barrel yesterday. May 10 (Bloomberg) -- Soybeans rose for a second session as a package of rescue loans in Europe eroded the value of the dollar and eased concern that economic growth will slow, boosting prospects for exports of the U.S. crop. U.S. stocks surged the most in 12 months and the dollar plunged against a basket of six major currencies after the European Union agreed to almost $1 trillion in loans to prevent a global debt crisis. The Reuters/Jefferies CRB Index of 19 raw materials gained 1.6 percent to 265.44, its biggest increase since March 29. “The dollar’s retreat is a sign that the fears of a global collapse have abated,” said Greg Grow, the director of agribusiness for Archer Financial Services in Chicago. The European bailout revived “the equity and commodity markets and reduced the concerns about an economic slowdown,” he said. Soybean futures for July delivery rose 1 cent, or 0.1 percent, to $9.61 a bushel on the Chicago Board of Trade, capping the first two-day advance this month. The commodity fell 3.9 percent last week, the biggest weekly decline since the end of January on speculation the Greek crisis would reduce demand for the oilseed. Prices also rose after government reports showed increased demand for U.S. supplies from China, the world’s biggest buyer of soybeans and second-largest consumer of corn, Grow said. Soybean imports by China climbed 10 percent to 15.2 million tons in the first four months from a year earlier, according to customs figures. Imports in April were 4.2 million tons, up from 3.7 million tons a year earlier. Soybean exports for delivery before Sept. 1 doubled in the week ending April 29 from the previous week and were 47 percent above the average of the prior four weeks, U.S. Department of Agriculture data show. China bought 180,000 tons for this year and another 168,000 tons for delivery after Sept. 1. “Demand is improving,” because prices are at the low end of the average the past three years, Grow said. The soybean crop in the U.S. was valued at $31.8 billion last year, second only to corn at $48.6 billion, government figures show. May 10 (Bloomberg) -- Crude oil rose for the first time in five days on speculation an emergency fund being prepared by European policy makers will be sufficient to contain sovereign debt risks and help maintain growth in the region. European Union governments may agree to an emergency lending mechanism worth around 500 billion euros ($645 billion), said a government official familiar with talks under way in Brussels. Oil prices will likely return to $80 to $85 a barrel once the debt crisis in Greece is resolved, Algerian Energy Minister Chakib Khelil said yesterday. The contract fell on May 7 as much as 3.4 percent to $74.51 a barrel, the lowest intraday price since Feb. 16. Prices slid even as Royal Dutch Shell Plc suspended contracted deliveries of Nigerian Bonny Light crude after a pipeline fire. Oil futures plunged 13 percent last week as the euro slumped and equity markets dropped on concern that Europe’s recovery may stall if Greece’s debt crisis was repeated in other nations. The euro rose for a second day, climbing 1.2 percent to $1.2904 per dollar in early Asian trading. 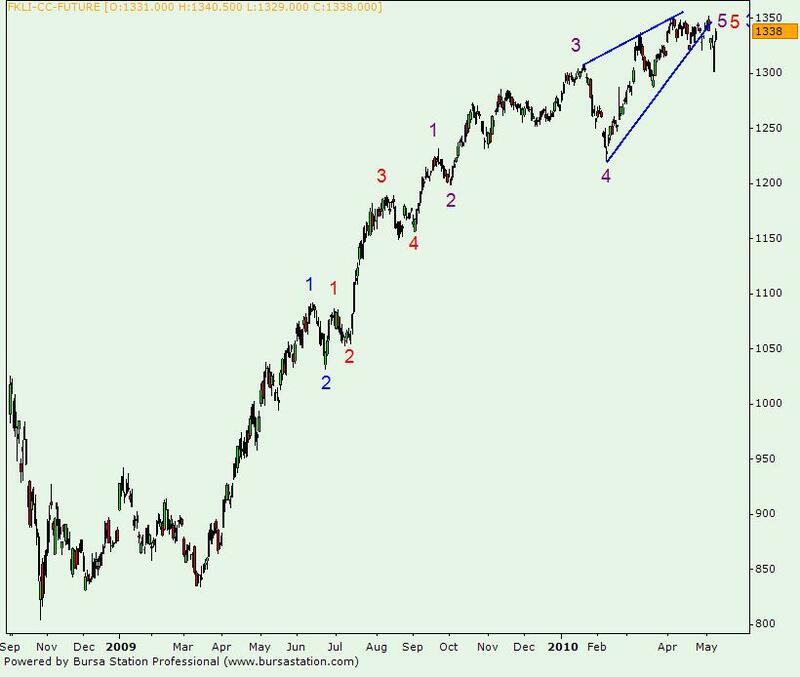 It reached $1.2529 on May 6, its lowest since March 2009. Oil touched $87.15 a barrel on May 3, the highest level since October 2008. Prices may have run ahead of the recovery in demand, particularly given the “over-supply” in the U.S. market, said Hassall. Still, global consumption is recovering, led by China and Asia’s emerging economies, and that will support prices, he said. “There will be traders with a longer-term view looking at this as a better entry point for speculative positions,” he said. Markets remain volatile and risk appetite among most investors remains “quite low,” he said. Brent oil for June settlement rose 80 cents, or 1 percent, to $79.07 a barrel on the London-based ICE Futures Europe exchange. 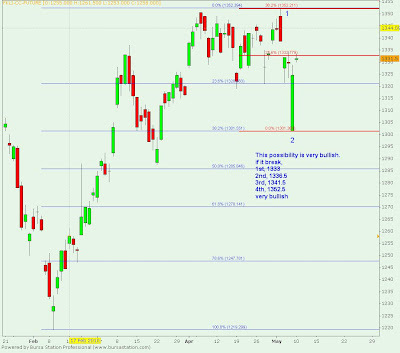 It fell 2 percent to $78.27 on May 7. Oil prices are at a reasonable level and the global recovery is proceeding at a “satisfactory” pace, OPEC Secretary General Abdalla Salem El-Badri said in Doha yesterday. The Organization of Petroleum Exporting Countries pumps about 40 percent of the world’s oil. The group cut production last year to prevent a glut as the world’s worst recession since World War II slashed demand. Demand in China, India and the Middle East is unaffected by the turmoil in Europe, and OPEC is likely to maintain its output quota for the rest of this year, Algeria’s Khelil said. May 10 (Bloomberg) -- Crude oil volatility has surged to its highest in almost two months as turmoil across financial markets prompts speculators to sell futures contracts. Oil’s 30-day historical volatility, a measure of how much crude fluctuates around its average price during that period, has jumped 53 percent from near a three-year low in mid-April. Hedge fund managers and other speculators have pared back their positions in crude by 14 percent in the past month, data from market regulators show. Oil prices dropped to the lowest in 11 weeks in New York last week. Oil futures on the New York Mercantile Exchange fell to $74.51 on May 7, the weakest intra-day price since Feb. 16, as the threat of contagion in Europe weakened the region’s currency versus the dollar and dimmed the hedging appeal of commodities for investors. Oil rose to an 18-month high of $87.15 a barrel on the Nymex on May 3. Its thirty-day volatility was at 31.087 on May 7, the highest since March 15. The Chicago Board Options Exchange’s Crude Oil Volatility Index, a measure of how much the commodity fluctuates in a 30- day period, climbed 41 percent last week, the steepest jump since its creation in 2007. It rose to 42.61 on May 7, the highest since Dec. 11. The index is calculated using options to buy and sell the United States Oil Fund, an exchange-traded fund that tries to match the price of benchmark West Texas Intermediate crude futures on the Nymex. While hedge-fund managers and other large speculators boosted their bets in the week to May 4 that prices on the Nymex will rise, during the past month they have reduced so-called net-long positions by 14 percent, data from the Washington-based Commodity Futures Trading Commission shows. Hedge funds’ net-long positions were at 109,870 contracts in the week to May 4, having hit a record high of 136,000 in the week to Jan. 15. The VIX, as the benchmark index for U.S. stock options is known, surged 86 percent last week to 40.95 for the biggest weekly gain in its two-decade history. Oil’s 30-day volatility had subsided to 20.295 on April 13, the lowest since July, 2007, as brimming stockpiles and rising investment by the Organization of Petroleum Exporting Countries eased concern over shortages. Since then Greece’s escalating fiscal crisis has shaken investors’ appetite for risk assets such as equities and commodities. Uncertainties have also grown about the long-term impact on U.S. drilling programs after Transocean Ltd.’s Deepwater Horizon rig sank on April 22. Some banks, such as Goldman Sachs Group Inc. and Barclays Capital, predict that erratic price variations are set to continue and possibly accelerate. Goldman Sachs analysts Jeffrey Currie and David Greely said in a March 31 report that commodity markets are set for “violent price spikes,” as investment constraints on new supplies and emerging market demand threaten shortages. Barclays’ Paul Horsnell said April 27 that price swings may intensify as global oil demand grows faster than supply and spare production capacity diminishes. One way for traders to profit from price swings is by purchasing or selling options contracts. When volatility is expected to rise, investors may use a strategy known as a long straddle, in which they buy both a call option and a put option on the same commodity, at the same strike price. The buyer gains in relation to how far the price of the underlying stock or commodity moves, regardless of the direction, while their potential losses are limited to the cost of the options. FCPO July Futures contract traded RM4 lower as compare to previous trading sessions to close at RM2519 with a total of 9,974 lots traded in the market. FCPO price was traded higher since open for trading despite trading weak in the earlier sessions as crude oil and soybean oil were traded weak during overnight trading. FCPO price retest support levels at RM2482; 78.6% Fibonacci support levels, despite attempt manage to only reach RM2484 levels with 123.6% and 138.2% Fibonacci support levels. Technically, FCPO seems temporary support above RM2480 and RM2455 support regions. 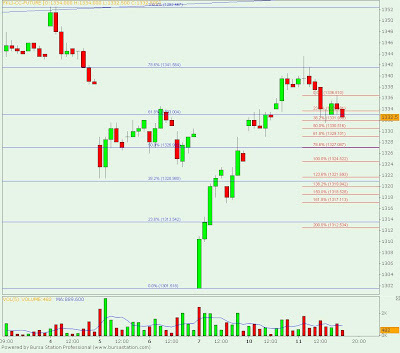 Failure to hold trading price above support levels shall indicates further selling pressure. However, FCPO trading price would preferable trading above resistance levels RM2525 and RM2564 in order to further affirm on uptrend formation in the hourly and daily price chart. 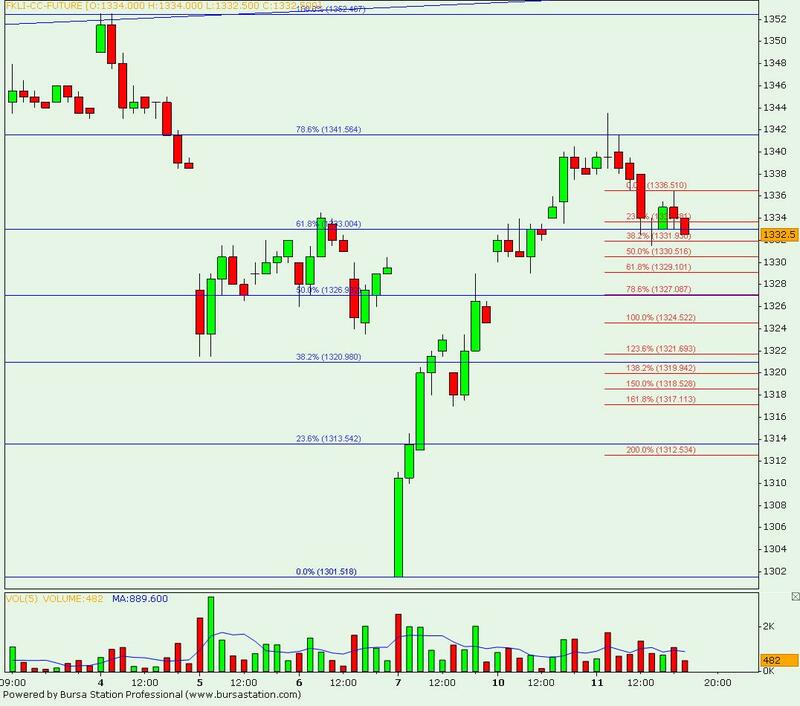 FKLI May Futures contract was traded 5 points lower as compare to previous trading session to close at 1324.5 levels with a total of 12,548 lots traded in the market. FKLI performed exceptionally better than regional indices and Dow Jones overnight trading as it recovered during trading sessions despite was opened 30 points below previous settlement value. FKLI opened lowest at 1301.5; 78.6% and 38.2% Fibonacci support levels and rebound towards 61.8% Fibonacci resistance levels at 1329 regions. 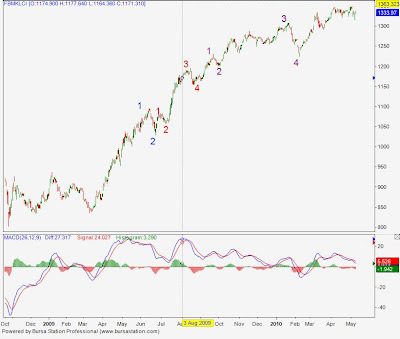 FKLI seems recovered from earlier penetration of previous support levels at 1321 regions. 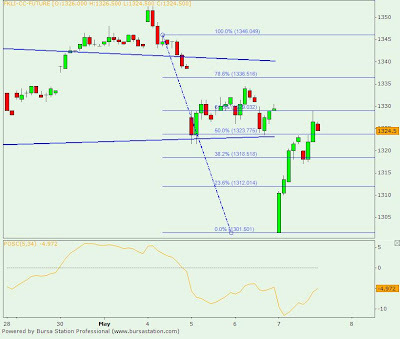 Technically, FKLI would reverse to bearish side provided resistance levels at 1329 and 1336.5; 61.8% and 78.6% Fibonacci resistance levels were not violated in the coming trading sessions. 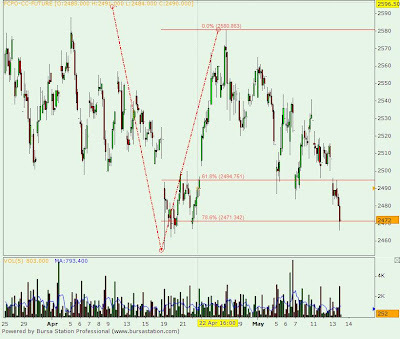 However, FKLI would further affirm trading south provided price was traded below support levels at 1317 and 1310 regions. Weblog Disclaimer : The information in this weblog has been obtained from sources believed to be reliable. Its accuracy and completeness is not guaranteed and opinions are subject to change without notice. This weblog is for information only and not to be construed as a solicitation for contracts. We accept no liability for any direct or indirect losses arising from the use of this weblog.